The U.S. Consumer Product Safety Commission (CPSC) estimates each year nearly 300 children younger than five drown in swimming pools and spas? 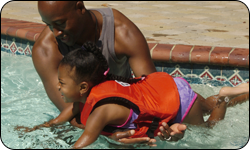 More than 3,000 children of that age go to hospital emergency rooms due to non-fatal submersion injuries? An unknown number of these hospitalizations result in permanent disability, including brain damage.